Readers will find themselves mysteriously written into the story as they watch God reach into broken and hurting characters, families, faith, and nations. Within the pages of The Sisters of Eselgroth: A Parable for a Broken Nation ($18.99, paperback, 978-1-61379-489-0; $28.99, hardcover, 978-1-61379-490-6; $9.49, eBook, 978-1-61379-438-8), a new release from Xulon Press author Katherine Suzanne Housewright, read about how God used the author’s walk with Him in her quest to bring her family together after more than 40 years of separation. Readers will find themselves mysteriously written into the story as they watch God reach into broken and hurting characters, families, faith, and nations. Believing readers will be drawn back to the story again and again and marvel at how God gently reaches past gender, cultural, national, and global barriers and brings eternal peace. In a warm, conversational tone, the author invites everyone to journey with her on this level path of sacrifice and redemption. Housewright—a teacher, storyteller, and ambassador among other things—is trained and serves as a prayer warrior to her peers. “‘I am’ sends me Himself,” she explains. An award-winning theatre director and nationally acclaimed advocate for children from conception to eternity, she also has spent 25 years as a teacher in her church, community, and nation—as well as at schools and cultural centers. She currently resides in Texas and works at Miracle You Ministries, which she founded in 2003. Xulon Press, a division of Salem Communications, is the world’s largest Christian publisher, with more than 8,000 titles published to date. 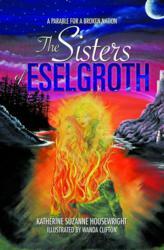 Retailers may order The Sisters of Eselgroth through Ingram Book Company and/or Spring Arbor Book Distributors. The book is available online through xulonpress.com/bookstore, amazon.com, and barnesandnoble.com.